INVEST IN FIT. Enter to win a luxury wardrobe of your choice from Poppy Barley (valued at $500) and MARGE Clothing (valued at $1000) when you sign up to the #PoppyBarleyxMARGE mailing list. Plus, automatically claim your exclusive discount code just for entering. Indulge in beautifully curated, thoughtfully constructed clothing and footwear essentials. Celebrate the luxury of you with Poppy Barley & MARGE. 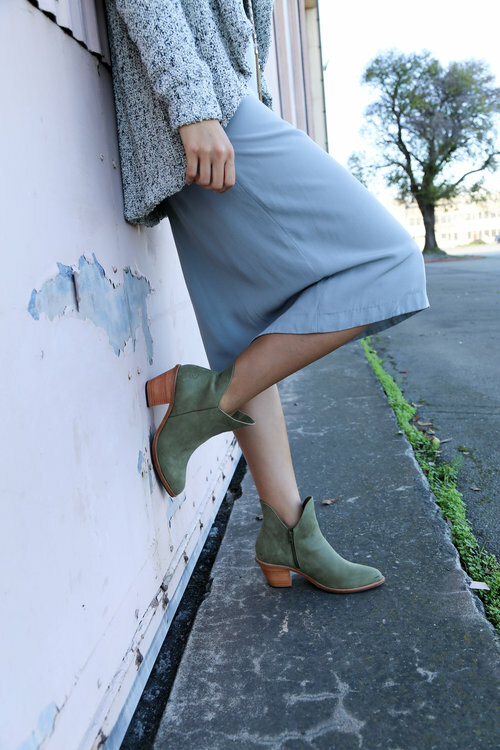 Fit Details: Two Point Five Ankle Boot in Army Green, Luna Blue Luxe Knit Cardigan and LIV Grey Crepe Slip Dress. Tell me when was the last time you tried on a garment or pair of shoes that had the trifecta of luxury: custom fit, quality and great design? I know. That's a tough one. Especially for us. Fit is probably the hardest of the three however I've partnered with @PoppyBarley & @MARGEClothing to champion a message to tall women everywhere: Celebrate the luxury of you with clothing and footwear exclusively designed to your unique frame and lifestyle. Poppy Barley is a premier designer of ethically handcrafted leather footwear in custom foot widths, calf widths and boot heights ranging in sizes 5 to 12. MARGE is a premier upscale womenswear brand designing luxurious collections and custom pieces for the tall, confident, modern woman. Want a chance to win a little bit of this luxury? Enter to win a luxury wardrobe of your choice from Poppy Barley (valued at $500) and MARGE Clothing (valued at $1000) when you sign up to the #PoppyBarleyxMARGE mailing list (link in profile), plus, automatically claim your exclusive discount code just for entering. Indulge in beautifully curated, thoughtfully constructed clothing and footwear essentials. If I could enter, I most certainly would...there is nothing like a custom made piece and both Both MARGE and Poppy Barley craft key pieces that are custom made for Tall women. Both companies hold themselves to the highest standards of construction and ensure that their products are special for every customer. They value the process and the final product and that makes their shoes and clothes valuable to me in more ways than one. Now there are some little rules to go with this amazing contest, so make sure you check them out and enter away. Also, stay tuned to the other lovely tall bloggers included in this giveaway and see how they styled Poppy Barely and MARGE! @CarolineGault, @GinnysCloset and @PrettyTallStyle. I wish you the best of luck! You deserve luxurious moments like these;) Celebrate the luxury of you with Poppy Barley & MARGE! *This opportunity ends Nov. 28th, 2016, and is open to Canadian and US residents only. By entering the contest, you agree to become a subscriber to PoppyBarley.com and MARGEClothing.com. If you are already a subscriber, you can still enter the contest. The prize is valued at $500 from Poppy Barley Inc. and $1000 from MARGE Clothing. Your orders will be placed and discounts applied in-house by Poppy Barley Inc. and MARGE Clothing after the contest closes. The winner will be selected at random and contacted via email the week of Nov. 28th, 2016. There is nothing like a custom piece of clothing and I found a local (Oakland, CA) designer (who also happens to be my friend:) that creates some amazing pieces that he will make specifically for you. While designer Rickie Lee has Roc Rio Designs for purchase right off the rack, he will custom tailor the length of the arms and torso just for Y-O-U and anyone that you want him to design for. Simply enter your information, the garment and your desired customization on his contact page. You will not be disappointed! I love my Sheath hoodie and you might just see me running around The Bay in it on a regular basis:-) PS. If something is out of stock online, you can still request it on the contact page. Now for the overall look...I added a faux leather mini to pump it up a little and some over the knee boots (which are almost out of stock, similar here) because I can and they are fabulous. It's really hard to go wrong with this chic hoodie. You can (and I do) wear it with anything. You can dress it up or completely down. It's a versatile, comfy-chic piece (and we all know that comfy-chic is my thing). Thanks for your style voice Mr. Rickie Lee:-) Your creativity is felt and completely appreciated. I wish nothing but great things for your line and love seeing people Roc Rio around the world!